Not quite sure how I found this website, but I have been having way too much fun crocheting these thoroughly modern flapper hats. These two are the Muriel pattern. My girls adore them and have requested one in every color yarn I have available and then some. Plus, they want interchangeable flower pins to wear with them. 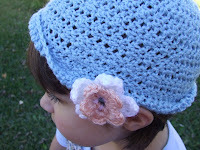 I used this picot flower pattern and just pinned them on with a safety pin. I haven't finished perusing the whole website and haven't decided what to try next. Oh my gosh, don't let them see these or my fingers will never be still again! I am off to try to recover from "project mode". I want one! And if I have a baby girl, she wants one too! Hey, can you call me later today...I'm hatching a plan and need some accomplices! I am definitely making these for my girls. I was looking for an airplane project for our 18 hour flight to china. Think they will let me bring a crochet hook on the plane? Oooh. I have no idea whether or not crochet hooks are on the list of banned items. Most of these patterns use a size I hook which is one of the medium size ones so it's not like you are taking one of the tiny little ones that could be considered a sharp object. OK, I just read that article and I have to say that the person who made this rule was not a crafty person. To think that a crochet hook could substitute for knitting needles is just silly. Nikki, I would make sure that yours was plastic. The metal ones might look more threatening to the untrained eye. These hats are so cute! I am going to show them to my mom, who is looking for things to do for my nieces for Christmas. And maybe I will even try to learn to crochet again! Those are so beautiful! I wish I could crochet. You've done a lovely job (and have two darling models). 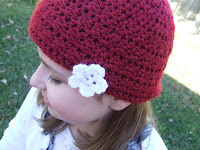 Crochet is much cooler than I previously thought...forgive me my former knitter's prejudice, these hats are amazing!!! I wish my girl were little again. I don't think she would go for the flowers, sigh. Oh so cute! I love that - it looks like just like the caps from the Kit books. Totally darling! You did a beautiful job. I have got to try one - thanks for the links.